AQUACROSS travelled to Sharm el Sheikh, Egypt, to present AQUACROSS results and tools at the 2018 UN Biodiversity Conference. 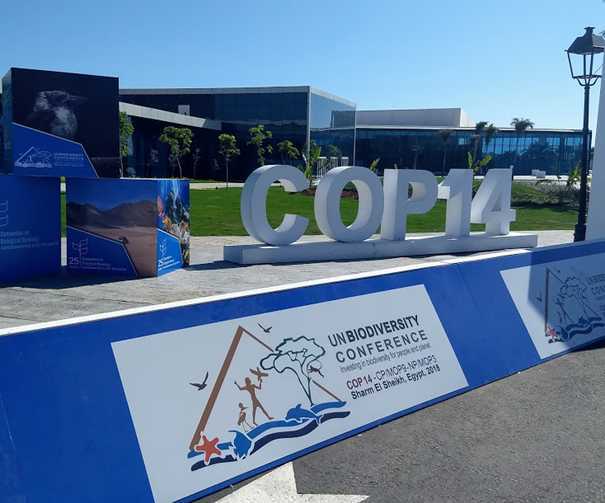 The UN Biodiversity Conference, officially titled the 14th meeting of the CBD Conference of the Parties to the Convention on Biological Diversity (CBD), took place from 13-29 November 2018. The Convention on Biological Diversity is a multilateral treaty that aims to conserve global biodiversity, promote sustainable use, and share benefits. The European Union, along with 195 nations, is a signatory. Approximately 3,800 representatives from government, NGOs, indigenous groups, academia, business and more came together to discuss the theme, “Investing in biodiversity for people and planet”. Hugh McDonald (Ecologic Institute), AQUACROSS Case Study Coordinator, presented results and useful tools from the AQUACROSS project. At an informal side-event organised by AQUACROSS partners IUCN and featuring discussants from the EU Commission, he introduced the AQUACROSS case studies and key project results. This included the forthcoming AQUACROSS ecosystem-based management cookbook, the AQUACROSS Information Platform, and the AQUACROSS AquaLinks tool. AQUACROSS was also invited to participate in two EU Commission-organised events. At the first, a side-event on Nature Based Solutions, Hugh McDonald discussed how ecosystem-based management facilitates biodiversity management that provides multiple benefits to diverse beneficiaries. The second event was the 4th Science Forum, which sought scientist input to shape the post-2020 Biodiversity agenda. Here, over two days of presentations and small group working sessions, scientists from around the world discussed how biodiversity targets could be made more ambitious, effective, and fair.